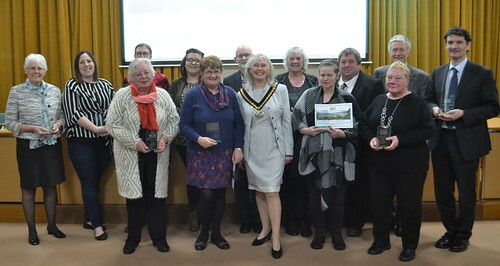 The voluntary work of Derbyshire Dales people who go the extra mile for their communities was celebrated at an awards evening on Tuesday (12 March). The Chairman of the District of the Derbyshire Dales, Councillor Jean Monks, hosted the 2018/19 Community Awards at the Town Hall in Matlock, where the audience heard numerous accounts of enthusiasm, dedication, kindness and compassion. "I am in awe of the voluntary contributions you make to our communities. It is fantastic to hear about the work that takes place on a daily basis and it has been lovely to acknowledge a few of the people who contribute to making our communities thrive." Among the recipients was Patricia Laughlin, Chairman of the Trustees of Ashbourne Community Transport, one of the local charities being supported during Councillor Monks' fund-raising year in office. Patricia has also been a Derbyshire schools governor for more than 32 years, is Chair of the Brailsford and Ednaston Parish Council, Treasurer of the Brailsford Institute Committee and a former Treasurer of the Ashbourne sub-branch of CAMRA. Another parish council chairman, Barbara Bowman of Cromford, was also among the recipients. The ceremony heard that she is also involved in Celebrating Cromford, Cromford Apple Day and recently started a flower show in the village, organising a plant sale every year to raise funds for the Celebrating Cromford team. Matlock Hurst Farm stalwarts Tom and Anna Casey were unable to attend, but, receiving the awards on their behalf, Matlock Mayor Helen Legood said: "Tom and Anna work tirelessly to improve Hurst Farm and Matlock in general, involving Castle View School, the community centre and the social club to run events to raise money. They work hard to improve safety for residents, chairing meeting, being secretary to both the community centre and social club. They also run a golden club for older residents and organise a Christmas party each year for them." Amanda Goodall and Leanne Ryder, who run the successful Hurst Farm Youth Club, were also award recipients, praised for their efforts in providing opportunities for young people on the estate and working tirelessly towards making the Hurst Farm a better place to live. Diane Edwards received her award after being nominated for her outstanding contribution to the village of Monyash, where she runs the village hall, chairs the village WI, organises the well dressing and is active in Hobbs, The British Legion and Young Farmers. Tansley resident Christopher Knightley was described by his nominee as being "totally dedicated to running Tansley Village Hall, ensuring it is always clean, warm and welcoming", promoting the venue to a wide range of user groups and helping to upgrade the facilities. Well known Hathersage woman Jane Marsden was Chair of Outseats Parish Council for many years until it joined with Hathersage Parish Council, of which she is now Vice-Chair. Also Chair of the planning committee, she is an active member of Hathersage Swimming Pool Committee and was described as a pillar of the community, taking an interest not only in the various charities in the village but in the residents themselves, always being there to give reassurance, support and a helping hand if needed. Christine Piper received an award in recognition of her foresight in recognising that new housing developments near the Matlock Moor Methodist Church in Matlock represented an opportunity to transform the building into an extended community centre while still retaining it as a place of worship. The awards night heard that Christine had convinced the project team at Matlock Moor that they could turn their dream into a reality. Malcolm Roper was described by Baslow & Bubnell Parish Council Chairman Christopher Brown as an "unsung hero" of the village who had worked tirelessly for many years as voluntary maintenance manager for the Baslow Village Hall Committee, managing contractors, troubleshooting for users and doing some maintenance himself. He also kept the village green tidy without being asked and had always volunteered to help at events such as the winter festival and community orchard apple day, while never seeking the limelight. Bakewell Mayor Bill Storey said award recipients Mark and Sharon Wakeman had for many years supported organisations, schools and charities in and around the town. Mark joining the local Royal British Legion had helped save the branch from closure and his hard work as Poppy Appeal co-ordinator had helped increase in the last three years the annual amount raised from around £7,000 to more than £42,000. Chris Wigham of Hognaston was described as "an indispensable member of the community" and the "go-to man" for help. A former treasurer and an active committee member of the village hall, he was recently involved in staging the village pantomime there. He is also active in the local conservation group, repairing stiles, fitting new fixings, digging holes and getting stuck in with good nature and heart. Chris was also instrumental in setting up the original local First Responders and has recently been involved helping others to get financial support for getting two defibrillators in the village.